A Delhi-based tour operator gives blind travelers the opportunity to see the world through their senses other than sight. Said to be the only player in India so far supporting visually impaired travelers from across the nation, Rising Star Tours and Travels (RSTT) recently offered a three-day sight-feeling trip to Jaipur in the northern Indian state of Rajasthan. The trip began with an experiential bus ride from Delhi to Jaipur. 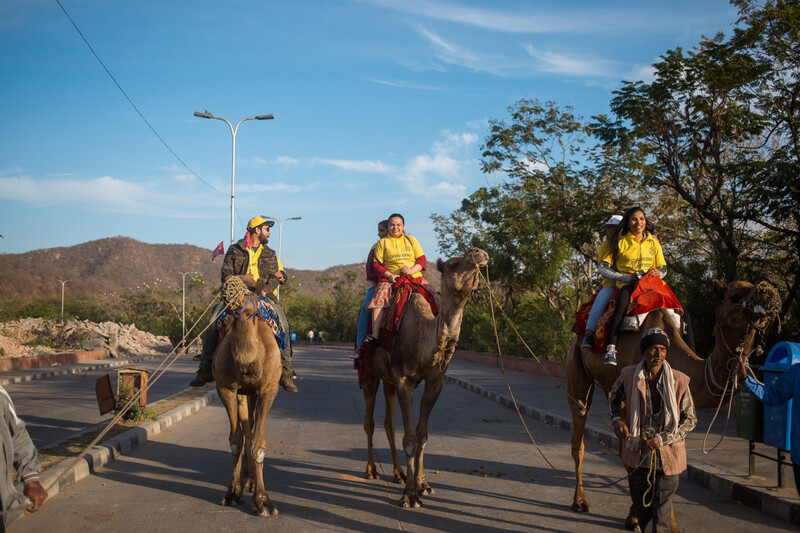 The travelers were then taken to several spots and participated in activities like horse-riding or camel-riding and shopping, being able to touch and feel everything. So far, 70 visually impaired people as well as volunteers from a diverse range of backgrounds and professions have attended the three-day trips. Most members were sponsored by other people, and the rest by RSTT. Over a period of nine months, the company says it has organized and sponsored three trips, namely to Pangot (Nainital), Rishikesh (Shivpuri) and Jaipur. "Our focus was to provide assistive travel for the blind community. We aim to help them discover a whole new world and become part of it. It is not about charity, it is about spreading happiness," said the company's founder Amit Jain in a statement. Looking at travel as a holistic experience engaging all the senses, RSTT is set to continue organizing such trips every three months to help sightless people explore the world.